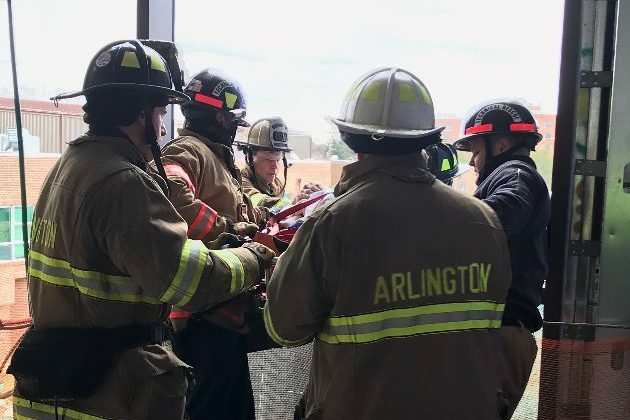 Firefighters rescue a worker on the second floor of the new Fleet Elementary School. 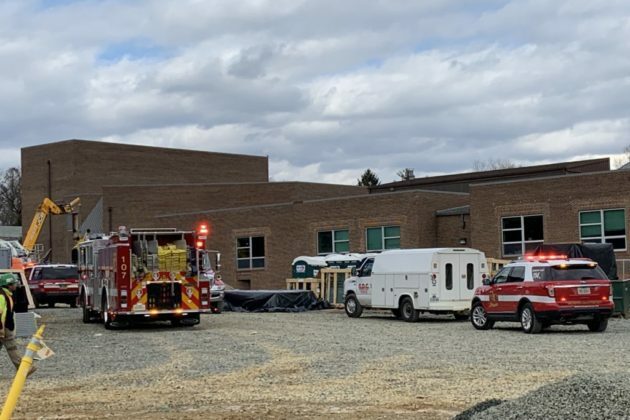 An ambulance leaves the scene after a worker was rescued from the second floor of the new Fleet Elementary School. Firefighters reach a worker on the second floor of the new Fleet Elementary School. 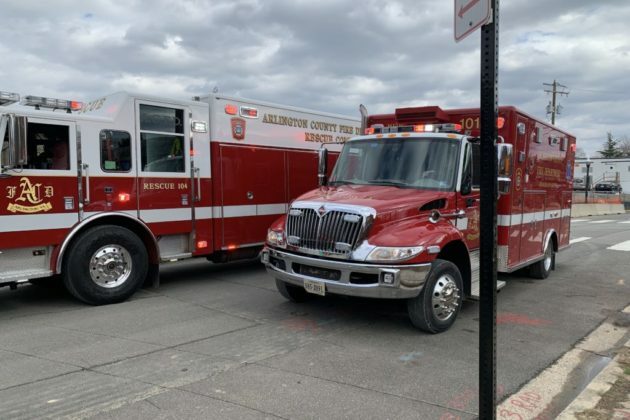 (Updated at 2:40 p.m.) Arlington first responders were called to the construction site of the new Alice West Fleet Elementary School this afternoon to rescue a worker. 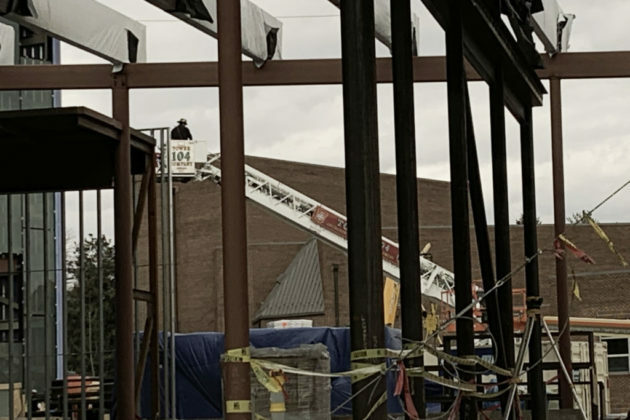 The worker in need of assistance was located on the second floor of the new school, which is being built adjacent to Thomas Jefferson Middle School at 125 S. Old Glebe Road. 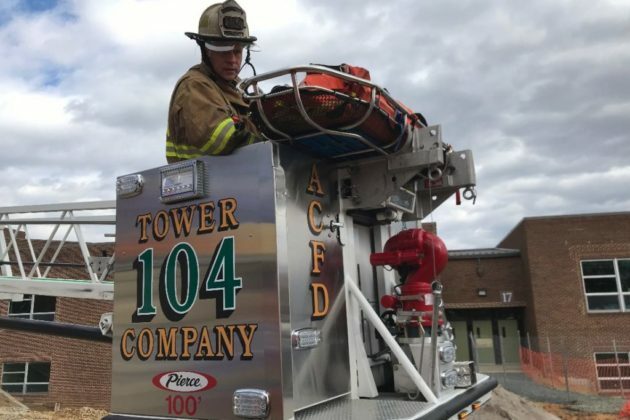 Fire department spokesman Ben O’Bryant told ARLnow that the man was injured after falling off a ladder around around 1:15 p.m. today (Wednesday). Firefighters then used a ladder truck to transport the worker down from the building’s second floor. 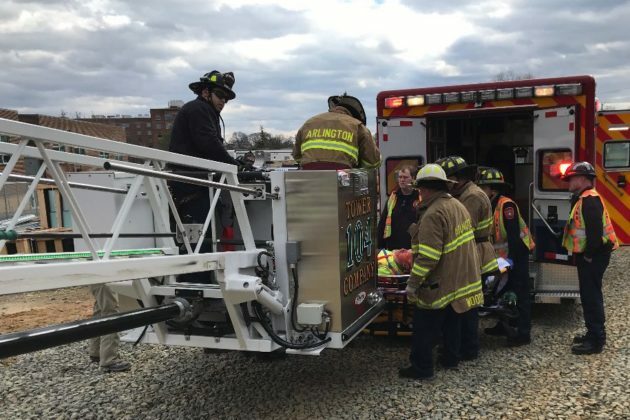 The worker was then taken to a local hospital, where he’s in “serious condition with non-life threatening injuries,” O’Bryant said. 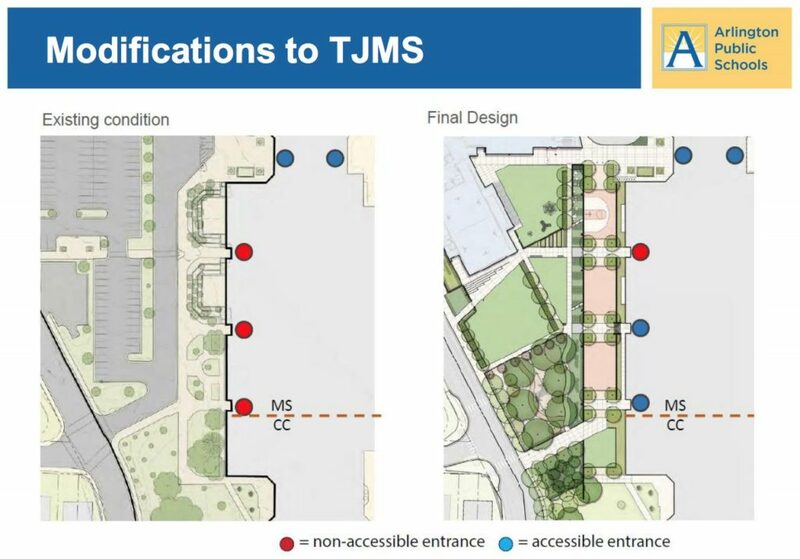 (Updated at noon) The price tag for a new elementary school could soon get a bit larger, in an effort to make the Thomas Jefferson Middle School more accessible for people with disabilities. Arlington Public Schools officials are asking the School Board to approve an extra $250,000 in spending at Alice West Fleet Elementary School, which is scheduled to open in September 2019, for Americans with Disabilities Act (ADA) changes at the adjacent middle school. APS officials plan to make accessibility adjustments at two of the middle school’s three entrances. Though accessibility upgrades are already in the larger APS budget, the size of the change to the Fleet budget means APS will need the board’s approval first. Voting on the matter is expected within a few weeks. The board is set to approve its fiscal year 2019 budget tonight. The nearly $637 million spending plan is set to fund pay raises for most school employees, but does call for slightly larger class sizes at both the elementary and middle school levels. Editor’s note: a previous version of this article mistakenly reported that the changes were planned for the elementary school. Photo courtesy Arlington Public Schools. Arlington Public Schools plans to add solar panels to five school buildings, including the soon-to-be-built Alice West Fleet Elementary School. APS issued a Request for Proposals on December 1, calling for companies to bid to install solar panels at Kenmore and Thomas Jefferson Middle Schools, Tuckahoe and Fleet Elementary Schools and Washington-Lee High School. Fleet Elementary School will be built on the site of Thomas Jefferson, and is projected to be open in September 2019. 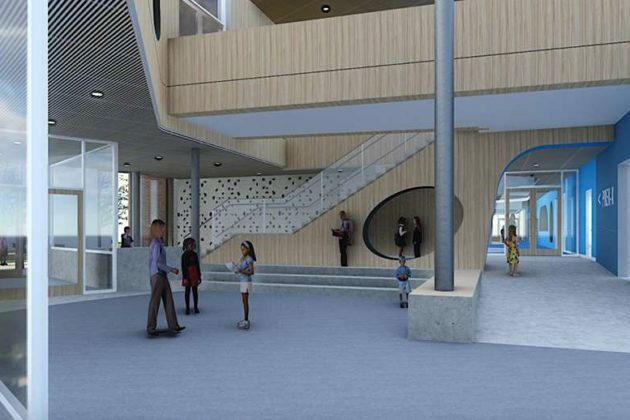 In the call for proposals, APS said it is seeking to be increasingly environmentally friendly in construction projects and its existing buildings, and hopes the panels will help it keep up with its schools’ energy demands. The successful bidder would install the solar panels, and operate and maintain them under a lease agreement with APS for a minimum of 15 years. APS said the winning company would also be responsible for all installation and maintenance costs, but would pay rent of $1 a year for the panels. Proposals are due on March 19, 2018. The RFP comes months after Kenmore was one of six sites in Virginia selected to have a solar panel installed on its roof as part of the Solar for Students program, which encourages hands-on learning about clean energy. 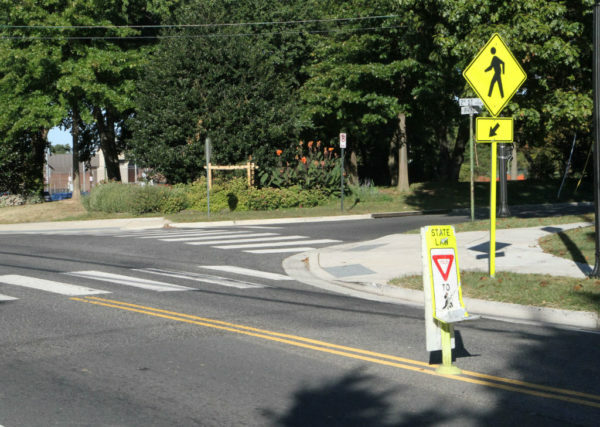 Parents of Thomas Jefferson Middle School students are petitioning for traffic calming measures on a stretch of road near the school where they report witnessing a number of vehicle-pedestrian close calls. They’re asking for a crossing guard and a traffic-calming measure — such as a four-way stop — at the intersection of 2nd Street S. and Irving Street, which is a heavily traveled pedestrian thoroughfare for students going to and from school. The entire stretch of 2nd Street S. near Thomas Jefferson Middle School, from Irving Street to Old Glebe Road, is well-traveled by vehicles and does not have four-way stops. Parents chose to ask for traffic calming at the Irving intersection because of the significant amount of both pedestrian and vehicle traffic at that particular spot. Plus it’s one of the few streets in the neighborhood that runs uninterrupted all the way from Columbia Pike to Washington Blvd., making it easier for motorists to speed than on adjacent streets. The intersection, like the others on 2nd Street, may not have four-way stops, but it does have painted pedestrian crosswalks. Neighborhood residents say motorists ignore people in the crosswalks, though, especially during morning and afternoon rush hours. “That’s prime commuter time and prime school time,” said TJ parent Alisa Key. The group of concerned parents invited county officials to visit the site to see the dangers that students and other pedestrians face. 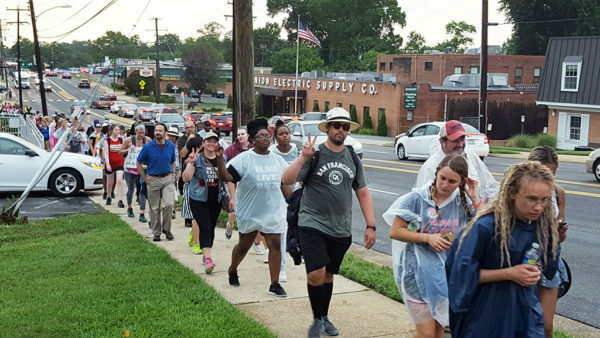 The group reports that a number of representatives showed up from Arlington Public Schools, the county’s Department of Environmental Services, the police department and the county board. Parents are hopeful that the results next week indicate the need for increased safety measures, including a crossing guard. In the meantime, they’ve been taking turns positioning themselves at the crosswalk in the morning to make sure children get to school safely. They’ve also started an online petition requesting traffic calming measures, which has more than 400 signatures. Parents are particularly worried about what happens when the volume of students increases upon completion of a new elementary school at the TJ site. The Arlington County Fair will kick off on Wednesday, August 16 at Thomas Jefferson Middle School (125 S. Old Glebe Road). For the 41st year, the county will host a variety of events for the community, including live outdoor music, a parade, fairground rides and game, food, floral and craft competitions, pig races and more. The fair’s outdoor programming begins August 16, with indoor programming beginning on Friday, August 18. The event ends August 20, with outdoor activities concluding at 10 p.m. that day. 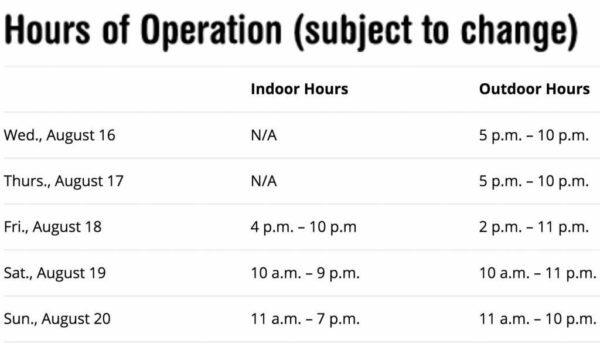 More details about the indoor offerings will be available closer to the time. Local organizations and business can sign up to participate in the fair’s parade, which is scheduled to start at the Career Center (816 S. Walter Reed Drive) on August 19 at 10 a.m. It will travel from the Career Center and end at the fairgrounds. There is no on-site parking at the fair, and street parking is limited to residents with permits. There are several other transportation options, including shuttle buses from the Ballston and Pentagon City Metro stations, the Career Center and the I-66 parking garage at N. Quincy Street and 15th Street N.
The fair’s live outdoor music schedule is below, after the jump. The turf fields at Thomas Jefferson Middle School are set to be replaced in the next year. 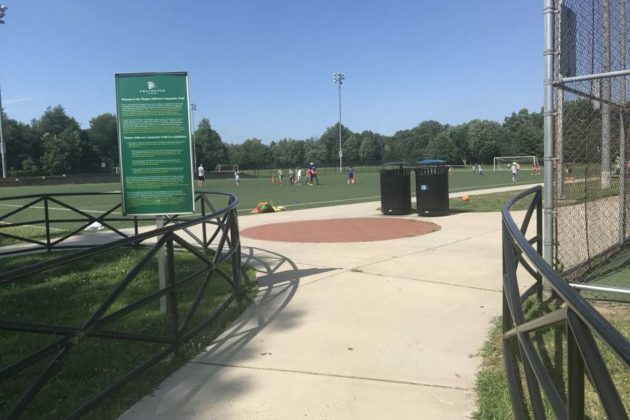 For the past eight years, the turf fields at TJ have been used in the neighborhood and for scheduled use by affiliated sports leagues and school programs. The upgrades at the field are part of the county’s Synthetic Turf Program, aimed at replacing heavily-used natural grass fields. 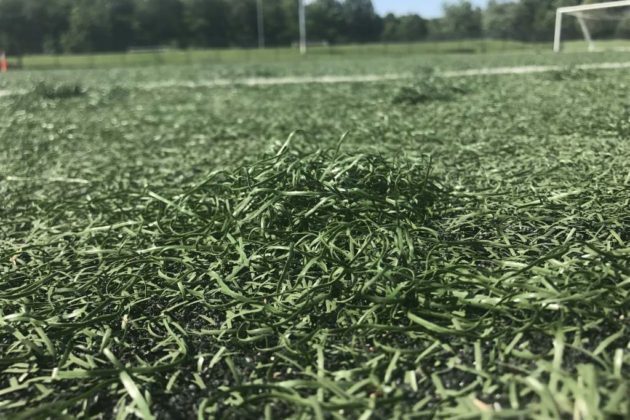 Currently, there are 15 synthetic turf fields in Arlington, although the move to add more has come in for some criticism from some. In addition to the new turf, the fields would get new corner flags and goals for soccer games, as well as new bleachers. 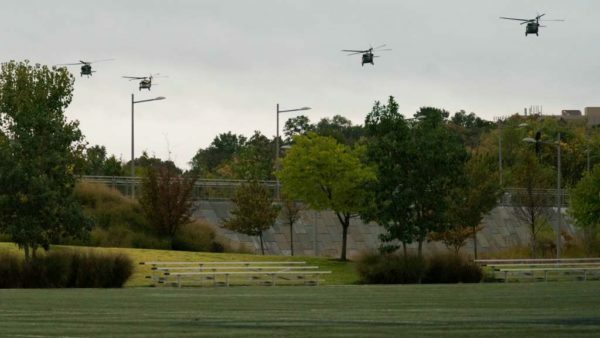 The upgrades would coincide with the construction of the county’s new elementary school on the west end of the site, and staff said Arlington Public Schools will plan out activities with the two projects in mind. APS will share the cost of the upgrades with the county. Just under $475,000 would be spent on the new field, with an extra $47,000 held as a contingency. Parents and community members are being asked to help choose the name of the new elementary school that’s being built next to Thomas Jefferson Middle School. A naming committee has narrowed down the choices, which included suggestions submitted via an online survey, to five. The finalists, each with an explanation from the naming committee, are below. 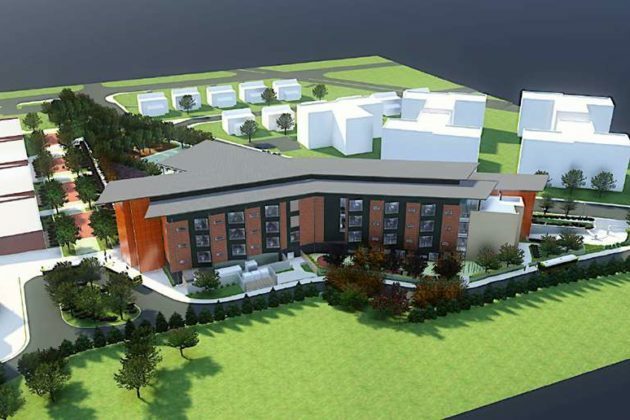 The new school is expected to open in September 2019. Students and staff will be moving from the existing Patrick Henry Elementary, near the Columbia Pike Branch Library, to the new school. The naming committee says it received input on both sides of the debate over the current school’s name. The committee heard compelling arguments both for keeping and for changing the name of the school. Some felt that keeping the name would provide continuity and maintain a connection to the school’s history, while continuing to honor one of our nation’s founding fathers. Others thought that the school name should be changed in order to avoid confusion between the new and existing school, or to reflect the creative design of the new building. Some also felt that Patrick Henry’s name should no longer be used since he owned slaves. The committee says it received more than 500 survey responses via its online form. Among the serious suggestions were at least a few from pranksters, we’re told; other name suggestions included Howard Stern Elementary and Pokemon Elementary. This time around, the committee is hoping to only receive input from Patrick Henry Elementary and Jefferson Middle School parents, students, staff and nearby neighbors. The County Board will debate the plan to build a new elementary school on the site of Thomas Jefferson Middle School at its meeting Saturday. The new elementary school at 125 S. Old Glebe Road would provide 752 seats and replace the current Patrick Henry Elementary School at 701 S. Highland Street. 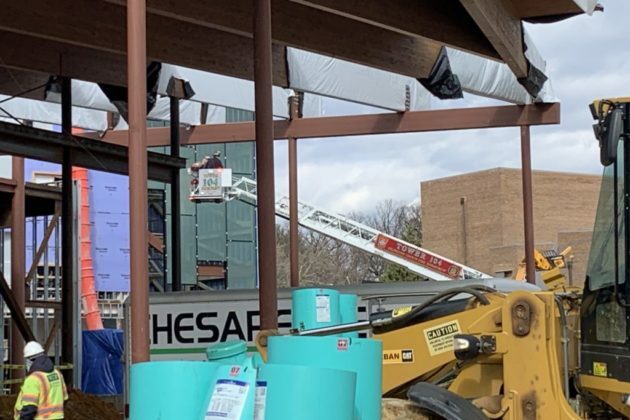 A naming process for the new school is underway. It is projected to cost $59 million and to open in September 2019. 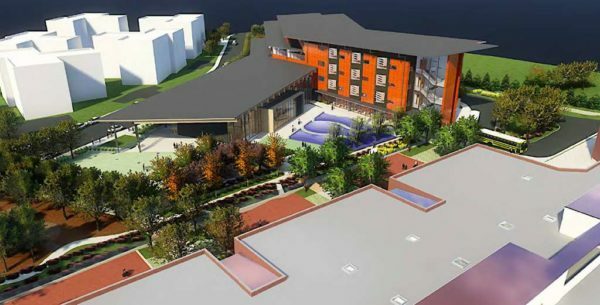 But a report prepared by county staff acknowledges the project still has concerns, including theater parking during construction, the impact on homes at the north side of the site, whether an existing surface parking lot should remain and neighbors’ desire for sidewalk improvements in an area outside of the project’s scope. As part of the approval process, the County Board will also discuss leasing county-owned land at the site to the School Board so the new school can be built. 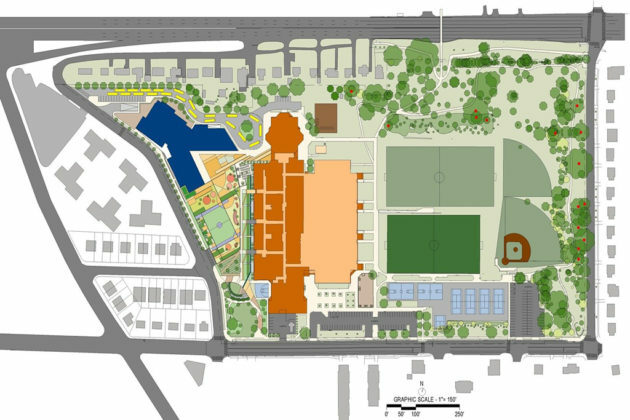 If the County Board allows the lease to be executed, Arlington Public Schools would then have the right to use the land to build the new elementary school and a 214-space, joint-use parking garage. The lease would be set to expire in 75 years, in 2092. A report by county staff found that executing the lease would not impact the county financially, but an agreement will be necessary to solidify how the county and APS will share the parking garage’s operating and maintenance expenses. Staff recommends approval of the use permit for the new school and the execution of the lease. A naming process is underway for a new elementary school being built next to Thomas Jefferson Middle School. The new school will be home to students of what is now Patrick Henry Elementary, which will in turn house the Montessori program currently at Drew Model School. 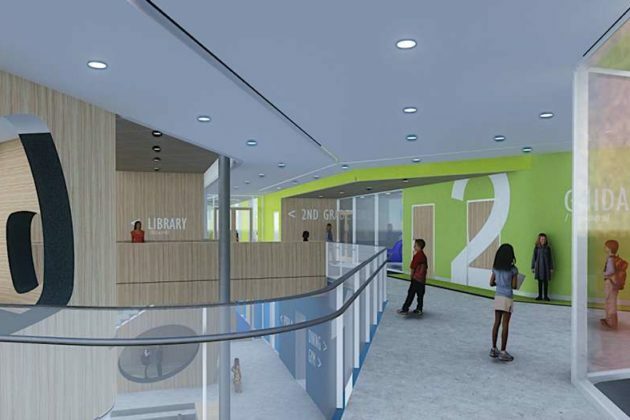 While Patrick Henry is being considered for the name of the new elementary school, which is set to open in September 2019, Arlington Public Schools has formed a naming committee to consider other name recommendations. The committee is encouraging stakeholders to weigh in on the name via an online Community Input Form, which was published late last week. The survey notes that while Patrick Henry was a Founding Father and Virginia’s first (and sixth) governor — remembered for his “Give me liberty, or give me death!” speech — he was also a plantation owner and slave owner. It asks respondents to consider the importance of “maintaining the current name in recognition of Patrick Henry” or, alternatively, “selecting a new name that reflects the diversity of the student body,” among other questions. The committee is expected to submit its naming recommendation to Arlington Public Schools later this spring.